A conservative group sent out a controversial mailer. The race to fill a Senate seat in Arizona has gone nuclear. Some Arizona residents have been sent a negative ad that broke new ground in the battle raging between Rep. Martha McSally and Rep. Kyrsten Sinema, the two candidates fighting to take outgoing-Sen. Jeff Flake's seat. 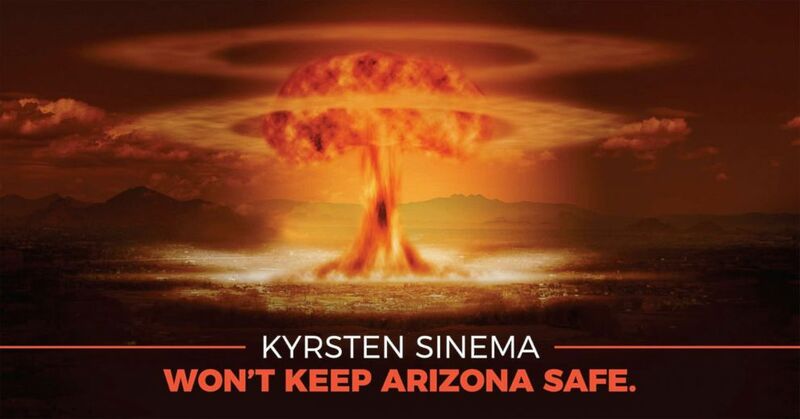 (Defend Arizona) A conservative PAC called Defend Arizona sent this mailer out to some Arizona residents, which at first shows Phoenix and then, when tilted, shows a nuclear mushroom cloud in the city's place. The front of the mailer is a hologram, which at first shows an image of Phoenix that, when tilted, reveals a mushroom cloud over the city, as if it had been targeted in a nuclear attack. 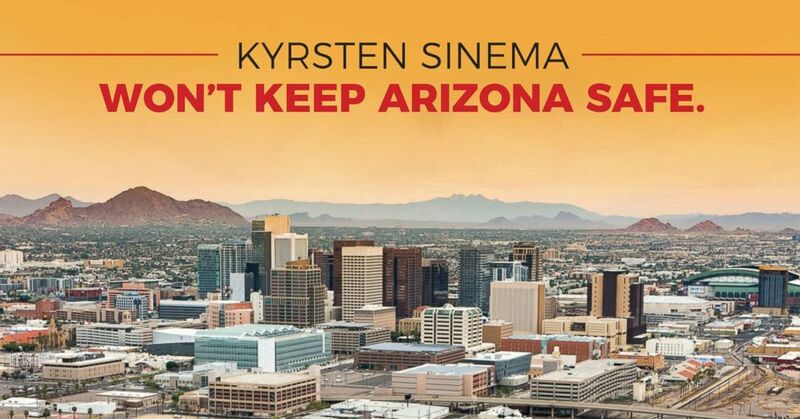 The ad reads "KYRSTEN SINEMA WON'T KEEP ARIZONA SAFE." On the back, it points to Democrat Sinema's "liberal ideology" which the ad says "will hurt our national security." Mailed out across Arizona this week, the ad was paid for by a conservative political action committee called Defend Arizona. A spokesperson for the group, which is supporting Republican McSally, confirmed to ABC News that they paid for the ad and they feel it was fair. The Sinema campaign blasted the ad and said it was the latest in a string of false attacks. "This mailer is another example of why Arizona newspapers said Congresswoman McSally is stuck in a ‘downward spiral,’" Sinema campaign spokesperson Helen Hare said in a statement. "Congresswoman McSally and her backers are using these ridiculous lies and attacks because she can’t defend her record of hurting Arizonans," Hare said. A spokesperson for the McSally campaign did not immediately respond to ABC News' requests for comment. 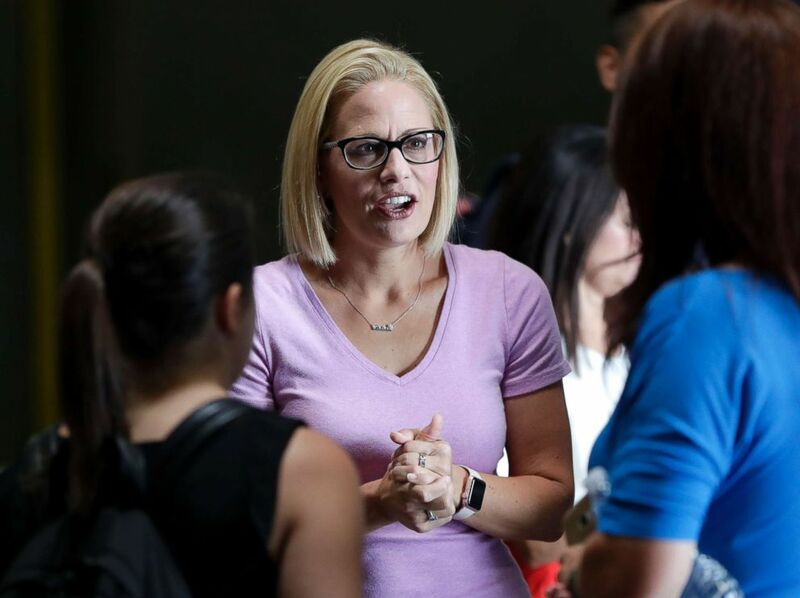 (Matt York/AP, FILE) U.S. Senatorial candidate, U.S. Rep. Kyrsten Sinema, speaks with volunteers in Phoenix, Aug. 21, 2018. Sinema is the Democratic nominee seeking the seat of retiring U.S. Sen. Jeff Flake in a race against U.S. Rep. Martha McSally. The mailer is drawing inevitable comparisons to the infamous "Daisy" commercial from the 1964 presidential campaign. That ad, by Democrat Lyndon Johnson's campaign, featured a little girl picking petals off a daisy, followed by an ominous voice counting down to the image of a nuclear bomb exploding. The suggestion: that the "hawkish" Republican candidate, Arizona Sen. Barry Goldwater, would involve the U.S. in a nuclear war. Barrett Marson, a spokesperson for Defend Arizona, said: "I'll let other people draw their own conclusions on that." "The mailer is designed to point out that ... there are issues with Kyrsten Sinema and her national defense qualifications," Marson said. 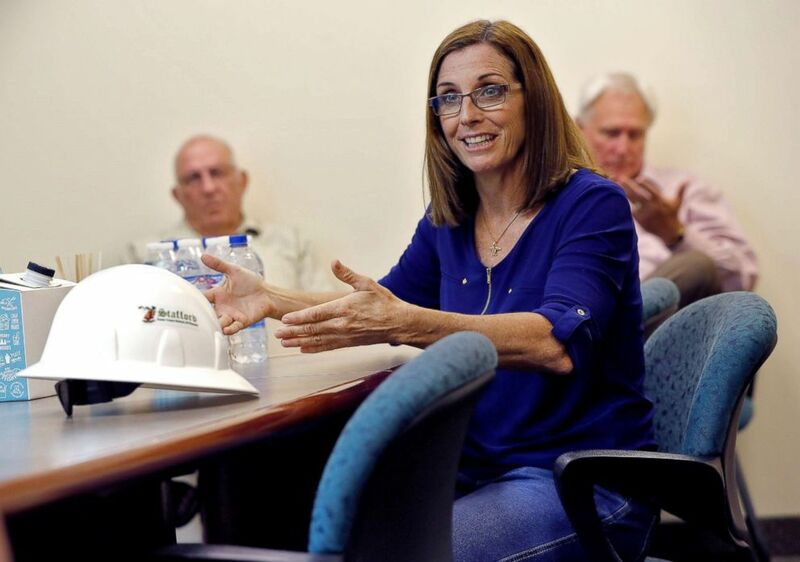 (Matt York/AP, File) U.S. Rep. Martha McSally, who is running against U.S. Rep. Kyrsten Sinema, for the senate seat being vacated by retiring U.S. Sen. Jeff Flake, talks to employees at a crane manufacturing and training facility, in Phoenix, Oct. 3, 2018. Marson said that Defend Arizona has received contributions from local and national donors, as well as some money from the Senate Leadership Fund, which has links to Senate Majority Leader Mitch McConnell. Federal Election Commission filings report that the SLF has donated at least $3.2 million to Defend Arizona. The negative ad blitz is not likely to end, as early voting started on Wednesday in Arizona and the race is believed to be very close, potentially within the margin of error, according to recent polling. ABC News's John Verhovek contributed to this story.